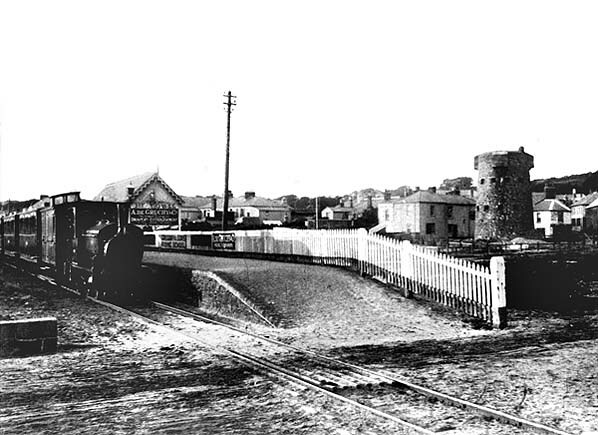 Notes: First Tower was one of the original stations on the Jersey Railway opening with the line on 25th October 1870. It got its name from the adjacent Martello Tower built as part of the island's defences against France. 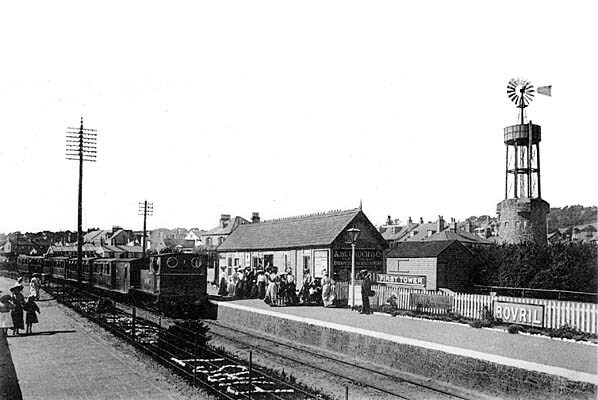 The station was on the up side of the line with a single timber building incorporating booking office and waiting room. There was a short siding at the west end of the station used for storing extra carriages which were used during the busy summer months. Initially the platform was built of timber but this was replaced c.1877. 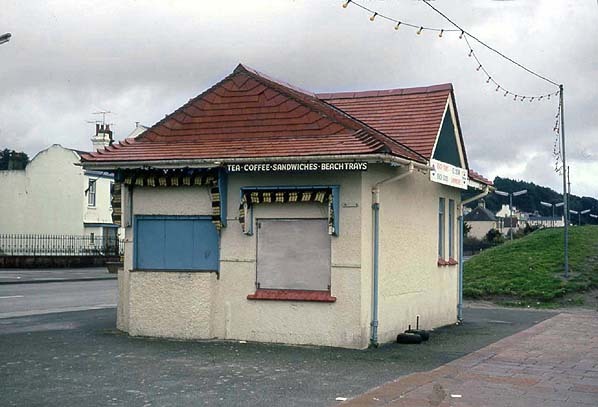 objections, final sanction was continually delayed as the Treasury objected to a clause which allowed the company to take possession of all the seashore below the high water mark without having to pay either the British Government or the States. On 22nd October 1869 a new Bill was submitted; this time there were no delays as it was passed on 22nd October 1869 and confirmed by Her Majesty in Council 20 days later. 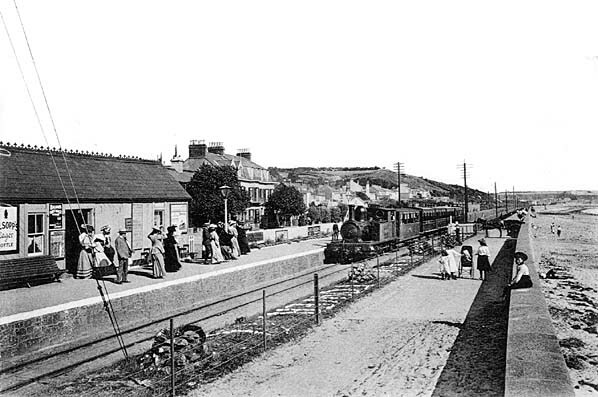 1884 the La Moye line was completed with the first trial train running on 15th March. 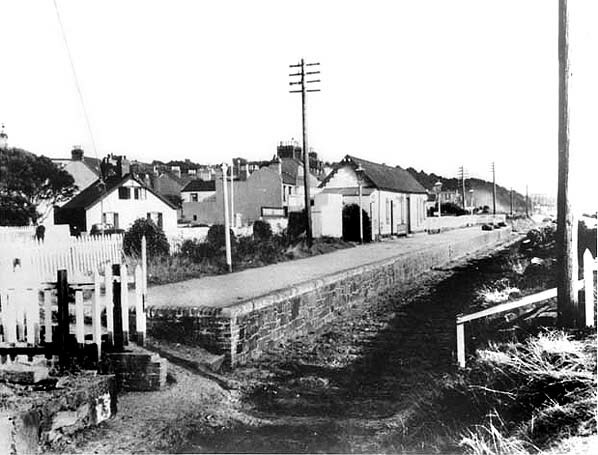 In February 1884 works started to convert the St Aubin - St Helier line to 3' 6" gauge. This was done in sections with trains kept running during the conversion, passengers being transferred to horse-drawn buses where the conversion was under way. traction was discussed along with an extension of the line from La Moye Quarries to a new terminus in the grounds of the Corbière Pavilion. 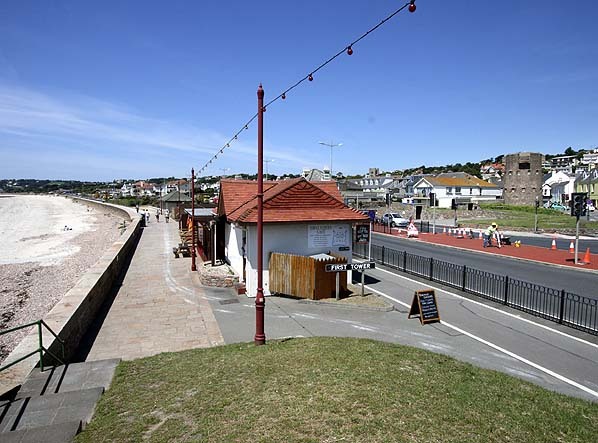 In order to do away with a severe curve to the west of St Aubin station, a new tunnel was excavated and brought into use on 26th December 1898.
ownership on the island. The bus company was also suffering from this competition, and from August 1928 the JR&T took over the Jersey Motor Transport Company, with interchangeable tickets between trains and buses being available, although the two concerns continued to run as separate companies. shortly afterwards. In order to ensure that the Jersey Motor Transport Company was not part of the impending liquidation, the JMT was transferred to the newly formed company Jersey Road Transport Ltd. An extraordinary general meeting was held on 28th October 1937 to pass resolutions that the JR&T should be wound up and that the directors be authorised to sell all the land to the States of Jersey for £25,000. Outstanding debentures and notes were redeemed and transferred to Jersey Motor Transport, its first directors being the former directors of the JR&T. were sold for scrap in 1899. Loco No. 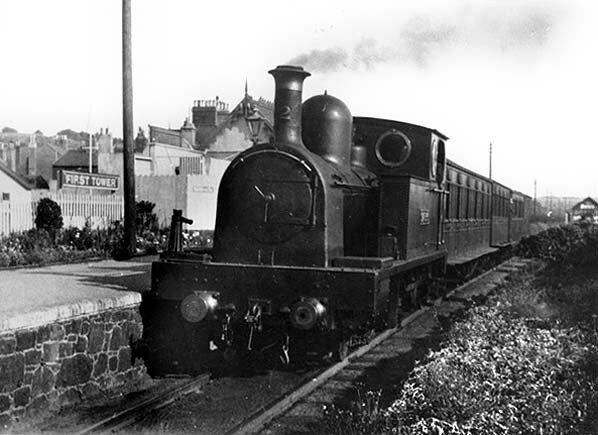 3 (Corbiere) hauling a westbound train into First Tower station c.1905. Loco No. 1 (St. Heliers) arriving at First Tower station with an eastbound train c.1910. The wind powered water pump on top of the Martello tower was added in 1898 to provide water for the trees along Victoria Avenue. The weight of the water cracked the tower and it was removed in 1926. Note the station name in flowers in the garden alongside the track. First Tower station looking east c. late 1930s, shortly after the track had been lifted. Looking west at the site of First Tower station in June 2010. The Martello tower is seen on the right.